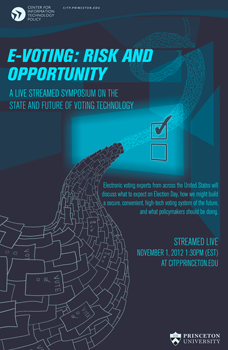 Despite the challenges due to Hurricane Sandy earlier this week, the Center for Information Technology Policy at Princeton is still hosting “E-Voting: Risk and Opportunity,” a live streamed symposium on the state and future of voting technology. At 1:30pm (Eastern) on November 1, 2012, electronic voting experts from across the United States will discuss what to expect on Election Day, how we might build a secure, convenient, high-tech voting system of the future, and what policymakers should be doing. The current U.S. e-voting system is a patchwork of locally implemented technologies and procedures — with varying degrees of reliability, usability, and security. Different groups have advocated for improved systems, better standards, and new approaches like internet-based voting. Panelists will discuss these issues and more, with a keynote by Professor Ron Rivest. You can watch the event streamed live at https://citp.princeton.edu. Here at Princeton’s CITP, we have a healthy interest in issues of open government and government transparency. With the release last week of the Open Government Directive by the Obama Administration, our normally gloomy winter may prove to be considerably brighter. In addition to creating tools like Recap and FedThread, we’ve also been thinking deeply about the nature of open and transparent government, how system designers and architects can better create transparent systems and how to achieve sustainability in open government. Related to these questions are those of the law.gov effort—providing open access to primary legal materials—and how to best facilitate the tinkerers who work on projects of open government. If you’re interested, come to our workshop next month! While we didn’t consciously plan it this way, the last day of this workshop corresponds to the first 45-day deadline under the OGD. Despite increasing interest in issues of open government and governmental transparency, the values of “openness” and “transparency” have been under-theorized. This workshop will bring together academics, government, advocates and tinkerers to examine a few critical issues in open and transparent government. How can we better conceptualize openness and transparency for government? Are there specific design and architectural needs and requirements placed upon systems by openness and transparency? How can openness and transparency best be sustained? How should we change the provision and access of primary legal materials? Finally, how do we best coordinate the supply of open government projects with the demand from tinkerers? Anil Dash, Director of the AAAS’ new Expert Labs, will deliver the keynote. We are thrilled with the diverse list of speakers, and are looking forward to a robust conversation. so that we be sure to have a name tag and lunch for you.